79.11 COMMUNIST CHINA IS A MINOR COUNTRY: Communist China is a minor country independently at war with Japan. Communist China becomes a Russian minor ally immediately following the outbreak of war between Japan and Russia. 79.12 TIMING OF PLAYER TURN: Communist China moves at the same time as Nationalist China. 79.21 EXTENT: Communist China consists of that part of China north of hex row M and west of the scenario start line. A. If Communist China is a Russian minor ally, Communist Chinese and Russian actions must conform. B. If the Chinese resistance level at the end of the previous turn was +2 or greater and Communist China is not a Russian minor ally, Communist China's actions must conform with Nationalist China's actions. 79.41 INFANTRY: Communist China may construct two infantry factors (one 2-2 infantry unit or two 1-2 infantry units) each turn. Communist Chinese infantry units may be constructed in any hex in China controlled by Communist China or Russia at the start of the Chinese turn which is supplied and not in a Japanese ZoC. 79.42 PARTISANS: Communist China may construct one partisan each turn. Communist Chinese partisans may be constructed in any Japanese-controlled hex in China. 79.43 CONSTRUCTION PROHIBITED: Communist Chinese units may not be constructed in Nationalist Chinese-controlled hexes, Manchuria or Hong Kong. 79.51 OFFENSIVE OPERATIONS: Russia pays the BRP cost for all Communist Chinese offensive operations. 79.52 UNIT CONSTRUCTION: There is no cost for Communist Chinese unit construction if Communist China or Russia controls Yenan. Otherwise Russia pays the cost of Communist Chinese unit construction. 79.53 PACIFIC SCENARIOS: In Pacific theater scenarios, there is no BRP cost for Communist Chinese offensive operations or unit construction, regardless of the status of Yenan. 79.61 COMMUNIST CHINESE SUPPLY SOURCES: Yenan is a limited supply source for Communist Chinese units. Communist China may draw supply from Chinese objectives which it controls. 79.621 RUSSIAN SUPPLY SOURCES: Communist China may draw supply from Russian supply sources, whether or not Russia is at war with Japan. 79.622 WESTERN ALLIED SUPPLY SOURCES: Communist China may draw supply from Western Allied supply sources unless Communist China is a Russian minor ally. 79.623 NATIONALIST CHINESE SUPPLY SOURCES: Communist China may draw supply from Nationalist Chinese supply sources only if the current Chinese Resistance level is "+2" or greater. 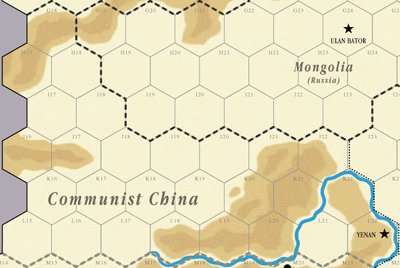 79.63 SUPPLY LINES: Communist Chinese supply lines may be traced through hexes controlled by Russia, Nationalist China or the Western Allies, but not through hexes controlled by Japan. 79.64 PARTISANS DO NOT REQUIRE SUPPLY: Communist Chinese partisans do not require supply (11.51). 79.65 ISOLATED UNITS: Communist Chinese ground units are never eliminated for lack of supply (30.542D). 79.71 COMMUNIST CHINA MAY NOT BE CONQUERED: Japanese capture of Yenan does not result in the conquest of Communist China. Communist China never surrenders. A. If Yenan is captured by the Japanese, Russia must pay for Communist Chinese offensive attacks and unit construction (79.52). B. In all scenarios, Yenan is considered an objective for victory determination purposes. 79.73 HEX CONTROL: For victory determination purposes, hexes controlled by Communist China are considered to be controlled by Russia. If Communist China is a Russian minor ally in a Global War game, Russia receives five BRPs for each Chinese objective controlled by Communist China. Prior to Communist Chinese activation as a Russian minor ally, no one receives the BRPs for Chinese objectives under Communist Chinese control. 79.81 COOPERATION RESTRICTIONS: Prohibitions against Nationalist-Communist cooperation (53.5) apply unless the Chinese Resistance level is "+2" or greater. 79.91 REFERENCE: See rule 80.